When someone begins talking about smart homes, images like a high-tech home theater or bedroom with dimmable lights comes to mind. We use voice command to turn on our TV and turn up the volume without ever leaving the couch. It can seem unusual to image expensive tech in the kitchen or bathroom, where water damage and other hazards seem too likely. However, your smart home wouldn’t be complete without including these spaces as well! 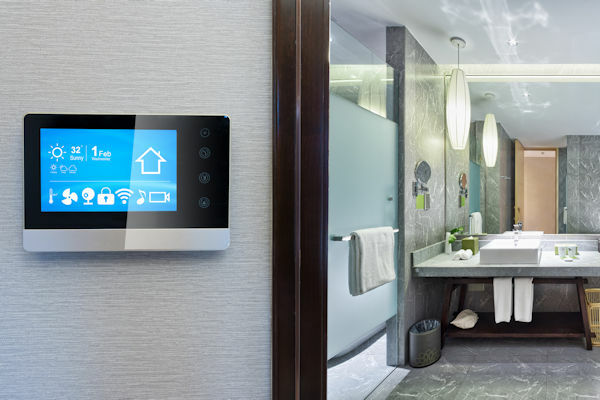 Here are 3 reasons to integration your bathroom and kitchen into your smart home. When your hands are full cooking in the kitchen or doing your child’s hair in the bathroom, a smart home system can come to your rescue. Voice command devices are becoming increasingly popular in homes across the nation, and are the perfect tech for these rooms. Ask your Sonos One for a quick dinner recipe or your favorite song, with audio streamed through speakers that match your interior design. Furthermore, you can use it to adjust lighting or temperature without taking a break from your current task. As a homeowner, we know keeping your family safe is one of your top priorities. The kitchen and bath are perfect spaces to include products that provide peace of mind. With the help of an app on your smartphone, monitor who’s at the front door with CCTV cameras, then answer through a high-quality intercom without ever leaving the room. Furthermore, the bathroom is a space in the house where privacy is most vital. Incorporate motorized shades for your bath’s large windows, available in a variety of styles, fabrics, and colors that sleekly pair with your bath’s design. The ideal home is a sanctuary from the stresses of everyday life, and every room deserves to add to the feeling. With a Lutron lighting control system, adjust the intensity of sets of lights to match your mood with sleek keypads. A brightly lit room boosts your energy, while soft lights help you relax. Your bathroom transforms into a spa with the simple addition of dimmed lights above and colorful tub lights below. Smart audio systems also belong in the kitchen and bath. Enjoy your favorite cooking playlist while you experiment in the kitchen, or sing in the shower to classic oldies blaring overhead. With smart technology integrated into your kitchen and bathroom, you can make the little moments of life a bit more fun, relaxing, and special.